Mark Reid’s research focuses on recent French fiction films depicting two generations of African diasporic communities in France. 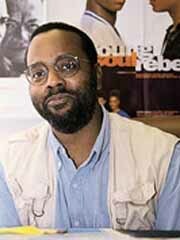 Reid is interested in the way fiction films portray the social integration of two formerly colonized African groups – Arabs from North Africa and Blacks from West Africa – as well as the integration of Black French West Indians from Martinique and Guadeloupe who have settled in metropolitan France. Reid’s survey of films includes those directed and written by West Africans, North Africans and Europeans who might reside in Africa, Europe or the Americas. His present research project is centered in French fiction films made during the 1980s and 1990s that dramatize the urban experiences of French-speaking North Africans, West Africans and West Indians.